A close examination of the face of this compass demonstrates the great care James Ramsey of Dublin took in crafting a piece that includes 360 lines marking degrees, ordinal as well as cardinal directions, and an elaborate image denoting North. This careful construction suggests this compass, which was made sometime before 1680, was engineered to the highest scientific standards of the seventeenth century. In addition to spending hours to make the compass, Ramsey probably would have constructed other pieces of surveying equipment to work in conjunction with the compass, including sight vanes (which look like tiny telescopes) and a protractor. This compass was first used by John Ladd (1657-1740), a Quaker who immigrated to America in the early 1680s, to lay out boundaries for the colony of West Jersey. It was also likely used to help lay out the city of Philadelphia, although documents from that period do not definitely prove it. In 1688, six years after the founding of Philadelphia, William Penn (1644-1718) awarded land to Ladd in return for surveying work done in Philadelphia. However, there is no record that Ladd labored with Surveyor General Thomas Holme (1624-95) on the official land assessment project. Therefore, it seems more likely that this compass was used to lay out individual lots or blocks within Philadelphia than to mark boundaries of the new city. The original borders of the city, from South Street to Vine Street and between the Delaware and Schuylkill Rivers, remained in effect until the Consolidation Act of 1854, which merged the city with the rest of Philadelphia County. This original footprint of Philadelphia, the area that came to be called Center City, was purposefully laid out with straight lines and especially wide avenues dividing the city into quadrants at the intersection of Market Street (initially called High Street, the traditional British term for a town’s main thoroughfare) and Broad Street. Penn, who had lived through the Great Fire of London in September 1666, designed his model city in order to minimize the risk of a conflagration spreading from one Philadelphia neighborhood to the rest. As another fire suppression measure, the original city plan designated five squares as common public spaces in the center of the city (later the site of City Hall) and in the center of each quadrant (creating the public spaces later named Franklin Square, Washington Square, Rittenhouse Square, and Logan Circle). As an especially valuable piece of equipment within the colonies, this compass later passed to Ladd’s son, John Ladd Jr. 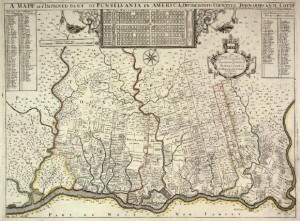 It was used again in 1740 to help lay out the temporary boundary between Pennsylvania and Maryland, decades before the surveying of the Mason-Dixon Line. The compass ended up in the collections of the Chicago Historical Society, on loan from the Historical Society of Pennsylvania for an exhibition, but it returned to the HSP in 1981 as a sort of anniversary present just before the three-hundredth anniversary of Philadelphia. The compass came into the collection of the Philadelphia History Museum in 1999 as part of a transfer of more than 10,000 artifacts from the Historical Society. This compass represents both the conscious creation of early Philadelphia as a green country town and the use of then-modern technologies to re-order the environment. Text by Levi Fox, a Ph.D. candidate at Temple University.